This article is the third installment of Sewing Notions and Tools, and it is all about buttons. 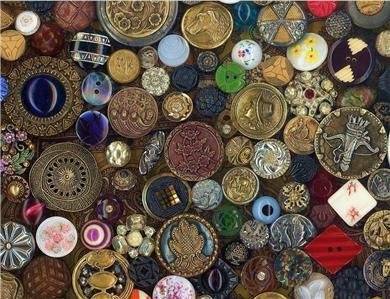 The collection of buttons from the 1800s-1940s shown here sold for $1800 in 2010. I have an auctioneer friend who once was asked to call bids at a button auction. His pre-conceived notion (pun intended) about the sale was a calm afternoon of old ladies who sew bidding pennies on such ubiquitous items. He was shocked at how wrong he was. A passionate crowd bid throughout the day with a ferocity he had not expected. When I planned on writing an article about collecting sewing notions (including buttons), I soon discovered how inadequate a single 700-word article would be to cover the many collecting categories that fall under “notions.” This article is the third installment of my Sewing Notions and Tools, and it is all about buttons. I had to ask myself if I considered buttons a notion or a tool. I decided they are both. While buttons may first have appeared for decoration, they soon became fasteners. Notions are both small objects that are sewn on a finished article and also small tools used in sewing. Buttons may not be a sewing tool, but they are certainly a fashion tool that keeps my clothing fastened. Primrose Peacock author of Discovering Old Buttons (1978), states that buttons first appeared in the 6th century AD, while Nancy Fink writer of Buttons: The Collector’s Guide (1993) contends that our prehistoric ancestors invented buttons and toggles. Whenever they began, innovation soon followed. There are almost innumerable types of buttons that have been made by everyone from craftspeople, artists, to children. The button is egalitarian; something everyone uses but is easily ignored. Buttons have been made of every possible material – leather, metals, shell, ivory, bone, plastics. I can’t begin to cover all of the collectible styles of buttons. The following are just a few to get you started down the rabbit hole of button collecting. While researching buttons I became enamored of the rebus button. “Rebus” is defined by Merriam-Webster as “a representation of words or syllables by pictures of objects or by symbols whose names resemble the intended words or syllables in sound.” So a rebus is a small picture riddle. An example of a rebus button would be this metal button pictured below that has interlinking letters “O” and “U” with an image of a deer. Can you figure out the riddle? A rebus button that translates into “Oh, you dear” sold for $16.20 in 2017. Others rebus buttons had messages like “What a (fish) story,” “Don’t (bee) (cross),” “My girl is a (bell)” perhaps gifted by admirers, and “U.R.A (crab)” an ideal gift for a non-admirer. “O U (monkey)” sold for $19.99 in 2012 and in the listing is described as a Cracker Jack prize. 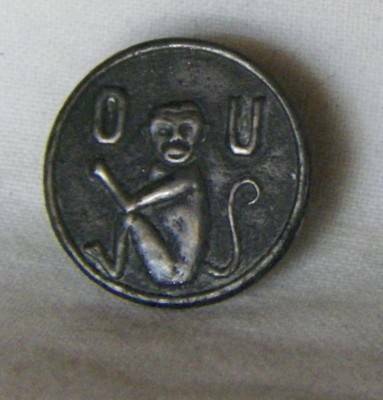 An early 20th-century “Oh, you monkey” rebus button sold for $19.99 in 2012. There are multiple interpretations for this rebus button in the photo below showing a dove with a clock under its wing. It has been called “Time for Peace” and also “Time Flies.” This button was likely manufactured in the 1930s, too late to be about WWI and likely too early be about WWII, so the time flies interpretation makes more sense. A “Time flies” rebus button sold for $29.64 in 2010. A close relative of the rebus button is the Story Button. These buttons illustrated scenes from fairy tales, mythology, operas, poems, even the reign of Queen Victoria was memorialized through buttons. This Puss In Boots story button below is particularly charming. A close relative of the rebus button is the Story Button. Here we have a Puss n’ Boots story button that sold for $30.77 in 2011. Art Nouveau buttons reflect the beauty of that period of art and style. In Great Britain, silver was used to create beautiful art nouveau style buttons. Many of these buttons carry the hallmarks of their maker, which can increase collectability. This set of 4 Art Nouveau sterling pierced floral motif buttons sold for $60 in 2008. Another feature of the Art Nouveau buttons is the handling of glass to imitate jewels, enamel, and incorporation of stones in their designs to make beautiful buttons. The French made their art nouveau buttons in other metals such as brass. 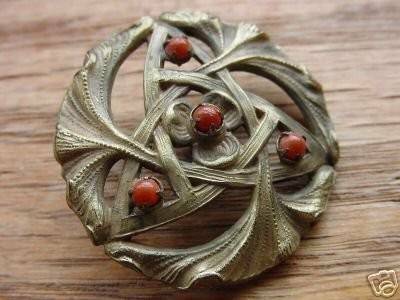 An Art Nouveau style filigree button with faux coral jewels sold for $28.72 in 2007. A French old metal button Art Nouveau Mucha style Lady and Apples sold for $46 in 2012. An elusive collectible button is the Secret Compartment button. They are so secret in fact, many may not know that their button has a secret compartment. I found few good examples to share, but I rather enjoy my new mission to unearth some secret compartments while button hunting. In the 20th century, celluloid, plastic, Bakelite, and Lucite buttons became very popular. They could be made in a variety of colors and shapes. The history and development of plastic is not going to be covered by this article, but suffice it to say, each of these materials has its own allure, strengths, and weaknesses for collectors. To identify the material, run the button in question under hot water. If it smells like mothballs or Vicks Vapor rub, it is celluloid (and stop putting celluloid in water because that isn’t how it should be cleaned). If the button smells like Formaldehyde, it is Bakelite (and get it out of the water). No smell? It is probably Lucite. This colorful collection of Bakelite buttons sold for $18.50 in 2010. Many of the buttons I find when treasure hunting are stored together in a glass jar or an old tin. It is better for buttons to be stored by the material of which they are made – shell with shell, metal with metal, etc. Celluloid buttons should not be stored in airtight containers as they give off gases that will cause them, and the other buttons around them, to disintegrate. Many old buttons are stored together in a glass jar or old tin. This tin of old buttons sold for $32.25 in 2014. Acrylic, Bakelite, Glass, Turquoise, Copper, Celluloid – wipe clean with a dry polishing cloth. Horn, Leather, Rubber, Vegetable Ivory, Wood – Use mineral oil to polish. Megan Mahn Miller is an avid amateur seamstress, auction consultant, auctioneer, and appraiser specializing in celebrity memorabilia and other hard-to-value items. You can learn more about her practice and how she can assist you with your personal property needs at www.mahnmiller.com.